Orthodontics means more than a beautiful smile: it means a healthy smile, too. Also known as dentofacial orthopedics, orthodontics is the dental specialty concerned with correctly positioned teeth, jaw bones, jaw joints, and chewing muscles. Now people of all ages can enjoy healthier teeth and gums and a better bite for normal chewing, swallowing, and breathing. With today’s evaluation and treatment techniques, ahealthy smile can be yours. Before planning treatment, your orthodontist examines your teeth, jaws, jaw joints, face, and profile, and studies how you bite and swallow. Your dental and medical histories are taken. If you’re looking for cosmetic changes in your smile or face, you’ll be asked about your specific goals for orthodontics. X-rays and precise measurements traced over them show how your bite can be corrected. Models of your bite, used to help prepare your appliances, show how your teeth and jaws fir together. Photos give you and your orthodontist a record of your profile, face, and teeth before treatment. An early phase of treatment may precede braces to take advantage of a child’s growing jaws. Early treatment moves jaw bones and chewing muscles into position, setting the stage for the most stable bite correction possible. This early orthopedic (or “bone”) pahse of treatment may last a year or more. A palatal expander gently widens a too-small upper jaw to make room for crowded teeth. A habit corrector helps stop thumb-sucking, tongue-thrusting (a swallowing habit), or mouth-breathing. Braces move a child’s permanent teeth into position. Headgear helps realign jaws or move teeth into line. 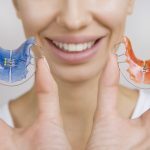 A retainer helps stabilize teeth in their new positions. The most common age group for orthodontics, teenagers have most of their permanent teeth and more mature jaws. Today’s braces are less noticeable than ever and won’t interfere with the active lifestyles that teenagers enjoy.Treatment may last one to three years and include a combination of appliances. Braces, either tiny bonded brackets or full bands, gently move to teeth into position. A retainer holds teeth in their corrected positions until they are stabilized. A functional appliance or palatal expander may be used on teenagers whose jaws are still growing. Extractions (removing teeth) make room for crowded teeth and may be needed for any pahse of treatment. More and more adults are seeking orthodontic treatment, eager for a more attractive face and smile, healthier gums, and freedom from jaw joint pain. Today’s appliances include less visible braces, so orthodontics can fit into any adult lifestyle. With fully mature adult jaws, treatment may take longer than for teenagers. 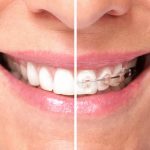 Braces options include bonded brackets and full bands, “invisible” lingual braces (which fit inside of teeth), clear or tooth-colored braces, and removable braces. A splint can help treat TMJ Syndrome (sore jaw joints). Headgear moves protruding teeth into position. Surgery may be recommended for severe bite problems to achieve a stable bite and more dramatic cosmetic result. After a thorough evaluation, your orthodontist diagnoses your bite problem (also called a mal-occlusion or “bad bite”). Your diagnosis helps your orthodontist plan which appliances (devices) will best correct your bite. Class I – your jaws line up correctly, but your teeth are crowded, crooked, or too far apart. Class II – your upper jaw bites too far in front, or your lower jaw bites too far back. Class III – your lower jaw bites too far in front, or your upper jaw bites too far back. Open Bite – When your molars bite, your front teeth stay open. Closed Bite – When your molars bite, your upper teeth cover your lower teeth. Cross Bite – When your molars bite, some upper teeth close inside you lower teeth. The length of your treatment depends on your bite problem, age, response to treatment, and cooperation with wearing your appliances as advised. The cost of your treatment may be based on how long you need to wear your appliances. Dental insurance may help cover the cost of your orthodontics. A winning smile takes teamwork, with you as a key player. Your orthodontist, office staff, and dentist offer years of specialized training, experience, and the latest technology. With your cooperation, they can help you achieve the best possible smile and appearance you can have.